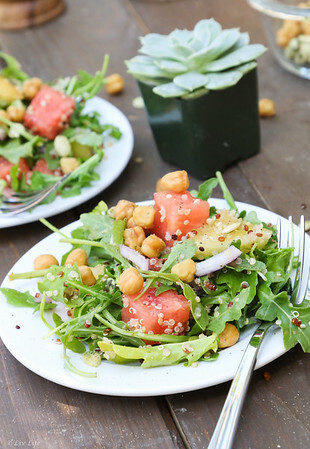 Sweet yet zesty, watermelon and arugula seem to have been meant for each other. Toss together at the last minute for a fresh, crisp salad that's sure to sing summer's praises. 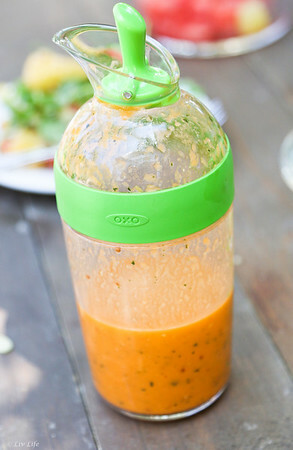 To make the dressing place all ingredients into a blender and process until smooth. Strain if desired (I don't strain). Place into a storage container and keep in the fridge until ready to use. Place greens, quinoa and chopped red onion in a bowl and toss. Add the watermelon chunks. Add desired amount of dressing and toss gently to combine. Serve onto serving plates and garnish with the crispy chickpeas and/or pumpkin seeds. Season with salt and pepper and enjoy! Liv Life Note: Note that the salad ingredient measurements are only a guide... add more greens, more watermelon, etc for a bigger crowd. Liv Life Note 2: My thanks to OXO for sending me an 8-Piece Glass Snap Set along with the super handy (I adore this thing!) 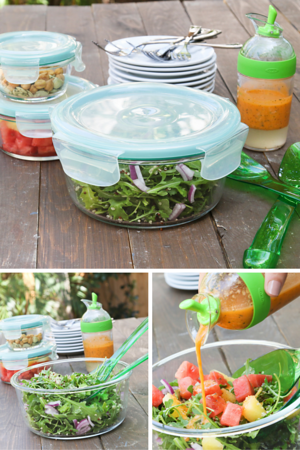 Salad Dressing Shaker along with a set of 2 in 1 Salad Servers (they turn into tongs too!). I wish it were cool enough to picnic in the park. I have to seek out those bowls as I will be taking my lunch to work next year. Collecting salad recipes like this too! My mom is wishing for cooler weather too... but I'm savoring every single warm moment!! I'm so glad!!! You have spring on the horizon! Yes!!! 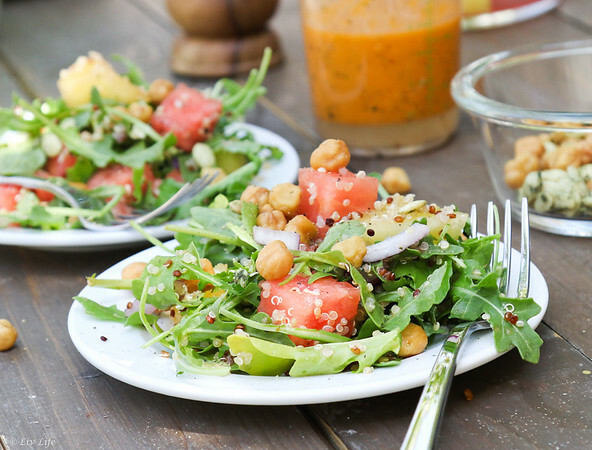 I am loving the long days of summer, and this yummy salad too!!! We just got back from a weekend camping trip in the Laguna Mountains-I had forgotten how pretty it is there :-) I hope you're having a fabulous summer!! I haven't been there in forever... I think I need a road trip. Glad you are enjoying this fabulous weather too!